The "Modeling Project" type is used for the architecture modeling. 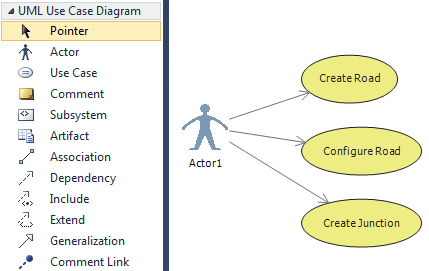 Here Activity and Use case diagrams can be used for requirements modeling. Then Layer diagrams can be used to represent the layered view of the system. If the system is component oriented, subsystems or components are represented using component diagram. Note: Code generation capability is added to the sequence and class diagrams only.